My geography was not exceptionally bad in JC1, I was still able to get a C or D for most internal exams comfortable when I studied for it. However, that run of good results ended as I started putting in more effort into other subjects and neglected my geography in J2. At Prelims, I was a U, shocking everyone in school with the appalling results, because it was not expected. Also, since the entire syllabus had been tested for Common Test in July and Prelims in September, I realised that I was unable to put everything into my head as easily as when the exams only focussed on parts of the syllabus. Mr Goh was my teacher in Sec 2, and I had done very well under him. In addition, I knew about Geog Café from there as well, so I decided to ask him for help just a month before A Levels. When I started, he told me that my knowledge was there, but it was just all over the place, especially for physical geography, and I was not as adept at being able to score marks because I was not employing certain techniques of writing or drawing diagrams strategically in my exams. Mr Goh essentially sharpened my exam skills, as well as adding content that he knew would be easier for me to remember, especially given we have many shared common interests. He also explained things in the school notes that were very disorganised, and shared material that helped me to improve my understanding on key concepts which I may have been lacking. Most importantly, Mr Goh gave me a kick up my backside. The neglect of the subject stemmed from always leaving it as the last subject of the day for revision. With tuition, I had to keep up with the pace of homework assigned to me by Mr Goh, and prepare for subsequent lessons, which essentially forced me to learn my contents well, and this was what got me through my Geography A Level exams. He even gave me more time than allocated at home tuitions just so that he could cover as much as he could for the lesson with me. 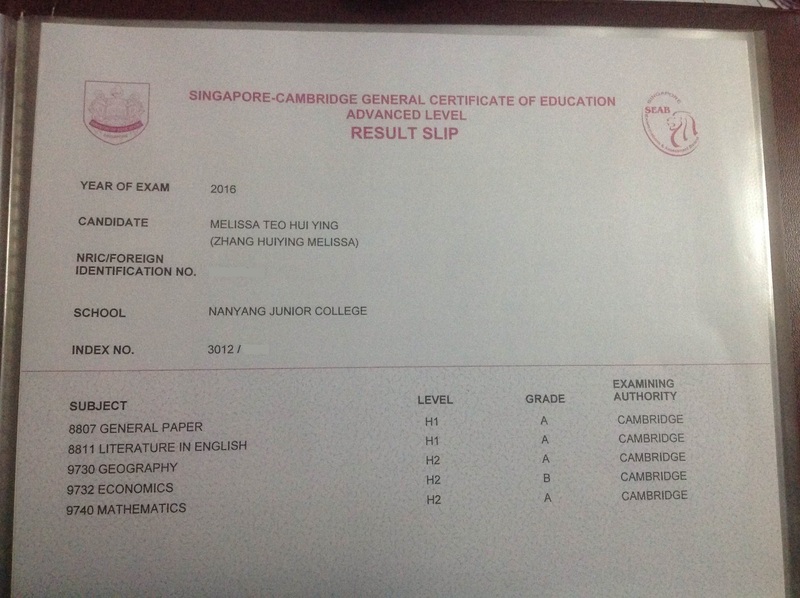 Although I did not even attempt 14 marks in Geographical Investigation, I still got an A, maybe a testament to the way I wrote my essays using the short but easier examples to remember, as well the writing techniques Mr Goh told me to utilise for essay writing. Closer to Prelims and A Levels, Mr Goh will mark student’s work, especially for one-on-one home tuitions, and I will definitely recommend him to any future Geography students who just need some guidance, to start acing school and national exams. After two stints with him, I would definitely say he is one of the best Geography teachers in the country at present. I retook my A levels in 2016 during my national service, as a private candidate. Previously, without tuition, I had difficulty cramming the seemingly endless quantity of information presented to me for each topic, and failed to see the linkages within the topics. This greatly affected my ability to tackle broad topic questions both in the essays and especially DRQs, which required me to adopt certain answering techniques, rather than solely utilising textbook knowledge. I stumbled upon geogcafe’s website in March 2016, and called up Mr Goh for class vacancies. Ever since, Mr Goh has greatly aided me in my understanding of the topics, by showing us a wide variety of real-life examples that has both made lessons interesting, as well as easier to retain the information. Despite me struggling to find the time to revise my geography and attend his classes at times due to my national service commitments, Mr Goh took the effort to follow up on my progress and made sure I clarified all my doubts so that I kept up with the rest of the class in revision. Together with the numerous essays and DRQs submitted to him that has been promptly marked with helping comments, Mr Goh has definitely helped me to ace my geography with a distinction. I believe that no matter how weak the student is, I believe that Mr Goh has the patience and experience to help his students to attain a distinction grade! I am a retainee who in my first year of JC, got U for Geography, and was in the bottom of my cohort. 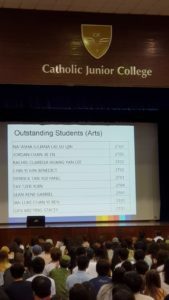 I joined Mr Goh’s class when I repeated JC 1, after the mid year examinations, for which I got D. By promos, my results had improved to a B. My struggle in Geography came from the difficulty in retaining such large amounts of information, and my inability to understand and answer questions, especially DRQs, and Mr Goh has succeeded in helping me with both. He conducts simple, easy to understand content lessons, which offer smaller bites of information, unlike the huge stack of lecture notes we are expected to read in school. His revision lessons were extremely useful where he taught me question analysis and answering techniques. Thanks to his guidance, I have managed to consistently score a B for geography in my school examinations, becoming one of the best students in the cohort and eventually got an A in Alevels, which I have previously thought impossible. His teaching, combined with the hard work that students themselves should put in, will definitely enable students to clinch that elusive distinction grade in Geography. After getting an S for my Geography grade in J1 Promos, I decided to join Mr Goh’s geography class after reading past testimonials on his website about Mr Goh’s competence with the subject. This was one of the best decisions I had made in my JC life, as Mr Goh is indeed an excellent teacher, using a combination of methods to help me significantly improve my ability to handle and process the Geography content, and I eventually scored an A for Geography in A levels. Firstly, Mr Goh arranged a number of content classes to run through the Geography content, breaking down difficult concepts and large details step-by-step to help us grasp the ideas and content that is necessary. While providing case studies, Mr Goh is often comes up with creative ways to help us remember the example, like relating the examples to his own experience, so that we may recall the example easier during exams. After running through the content, Mr Goh then introduced us to the various question types that can come out for the A level essays and short answer questions, teaching us how to unpack and answer the question fully in a concise and precise manner, so that we may be able to score the maximum number of marks with the least number of words. For me personally, I had an issue with writing speed and processing speed of the question, which had previously prevented me from completing essays on time. To resolve this issue, Mr Goh helped me come up with a strategy during A levels, teaching me how to quickly process and write concise and accurate answers for my short answer questions, which enabled me to save more time to write my essay. Mr Goh also taught me how to arrange my points and examples depending on the question type, so that I will not waste time during the examination thinking of how to write the essay. These strategies helped me to save so much time, I could complete the A level geography paper with extra time to spare. Mr Goh is an amazing teacher, and I would definitely recommend him to any student facing any difficulty in their geography subject. I’ve had the privilege of being taught by Mr Goh from June until my A levels and in that time I’ve come to find that Mr Goh really is a great teacher, the best geography teacher I’ve been taught by. His lessons really have everything you need in order to score an A for geography. Mr Goh is very knowledgeable about not only the syllabus and content but also exactly how to answer questions to gain maximum marks. He is able to explain complex geography concepts that were not taught well in school in a clear and understandable manner and also taught us techniques to study the large amount of content effectively. Lessons were also very engaging with videos and slides and he is also very animated and lively when demonstrating geography concepts to us. His classes not only deliver comprehensive content but are practice-based as well, allowing us to gain feedback on our work immediately and know our strengths and weaknesses. There is also a mock-exam held towards the end that is graded to help students practice even more with one-on-one sessions to discuss areas of improvement. Mr Goh also has ample resources such as extra notes, prelim papers with answers that helped me with my revision towards A levels. Despite joining the class for only 5-6 months, I felt Mr Goh’s geog classes helped me tremendously and I must say Mr Goh really cares about helping his students and seeing us improve, which only pushed me to work harder. Thank you Mr Goh for your dedication and help!!! After my National Service, I retook the A Levels in 2015, as a first-time private candidate. I would not have survived the journey without the guidance of all my teachers. I am certainly grateful to be taught by Mr Eric Goh. With his many years of experience, Mr Goh is a tutor whom you can place absolute trust in. In his interest field of geography, he has undoubtedly made lessons livelier by relating concepts to his own personal life experiences and stories, which also provided us insights and perspectives of the real physical and human world. This has benefitted our learning as we learn and understand beyond our lecture notes. I believe this is a very important aspect of a good Geography teacher. His passion for teaching proved his commitment to go the extra mile to support us in our learning too. This is another aspect that Mr Goh offers, especially important for me as I did not have a formal school to attend. I may have encountered failure 3 years back, but without you, I would not have improved tremendously from attaining ‘D’ in 2012 to ‘A’ in 2015. You have definitely played a crucial role in the toughest period of my life thus far. Here’s expressing my most sincere gratitude to this very amazing teacher! Do work with Mr Goh and I am sure he will help you to achieve your goals, just like how he has helped the many batches of students achieve too. ‎I approached Mr Goh for help after my JC2 Prelims, upon getting a borderline pass in geography, hoping he could do something to help bring my grade up in the short 2 month span of time before As. Despite his extremely packed schedule, Mr Goh was committed to teaching me, with lessons extending past midnight despite the long journey he had to make from one end of Singapore to the other to teach me. Nonetheless, the late night slogging was well rewarded with a distinction in the A level examinations, thanks to Mr Goh’s guidance. Mr Goh’s teaching is clear and concise, in the way he expresses his ideas and various concepts. Furthermore, he has a very good understanding of the syllabus and what the demands of the questions posed are, meaning his answers are succinct and straight to the point. In all, Mr Goh definitely helped me to make a improvement in my geography in a short span of time, and I would recommend anybody to go to him for help should they need it, even if it may be for a short period of time. In JC1, I struggled with geography. I felt very far behind my IP school mates who had prior knowledge and where thus able to grasp the concepts more quickly in lectures than I was able to. I encountered difficulties in comprehending the materials from my school which were lengthy and unconsolidated. My confidence fell and I was considering transferring to another subject. However, I was very fortunate to find Mr Goh through the website www.geogcafe.com. Mr Goh is a very passionate teacher. He is well read and clearly has a mastery over the content he teaches. What I found very helpful was that Mr Goh was able to answer more abstract questions I had which my school teachers could not and this gave me an edge over others when it came to producing more in-depth answers. Mr Goh has a wide range of resources and study materials including notes, interactive apps, videos and questions, all of which supplemented my learning significantly. Examples and explanations in these materials are well organised and saved me a lot of time when it came to preparing for my exams. Mr Goh also took the initiative to organise mock A level trial papers which simulated the actual Alevels and this prepared me for the actual Alevels paper mentally, as well as in terms of time management. Within a short time, I was able to catch up and I regained my confidence in the subject. I have since maintained a position amongst the top 10 of the cohort for all major geography school exams and have topped the cohort for block test 2 in my JC2 year. I am very grateful for Mr Goh’s guidance and highly recommend him as a tutor to any student aiming for excellence in geography. Mr Goh is an extremely dedicated and professional teacher. He always goes the extra mile to ensure that I understand the content, be it answering questions through whatsapp before exams or taking time to arrange extra classes. He is adept at simplifying complicated concepts into bit-sized pieces of information and teaches us how to spot the key requirements of different questions and answer to the point. He also ensures that we have sufficient practice in class and helps us draw links between theories we learn in class and practical applications or examples in the real world. His notes are straightforward and informative, and he provides us with many examples to supplement and improve our answers. He is very patient, knowledgeable and personable, and I know he is the main reason why I scored so well for my Geography A-level, achieving the ‘most improved student’ for geography prelims. Thank you for everything you have done Mr Goh! 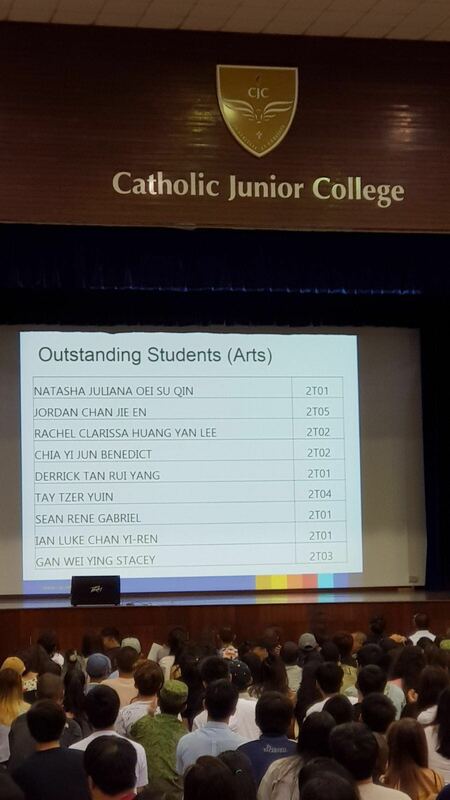 I never thought I had the calibre to score a distinction after getting Us continously throughout my JC life. 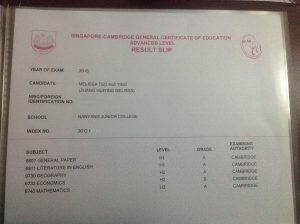 Even though it was a mere 3-4 months joining Mr Goh’s tuition, i jumped from a U in my prelims to an A in the A levels! It was due to Mr Goh’s clear explanations, vast knowlegde regarding Geography and precise skills that allowed me to get the grade. He constantly ensures that you fully understand what is going on and is willing to go any distance to make sure your doubts are all cleared. It was also due to Mr Goh’s mock papers that has helped me. After a paper, he would individually point out one’s flaws in their papers and how to improve one’s own methods of doing the paper. His extensive pool of resources that he generously distributes to anyone who needs it has played a significant role to achieve my grade as well. At the same time, the stories that he shares with us throughout lessons has allowed me to visualise certain theories and help me get a clear understanding of what is going on. Thank you Mr Goh for being a patient and caring teacher! Even though it was a short 3-4 months in his tuition, Mr Goh definitely played an extentsive role in allowing me to achieve my A! Mr Goh is a competent teacher and he is extremely well versed in the entire geography syllabus and also well read, with knowledge of many real life examples. He would explain any questions I have in a simple and comprehensive manner, giving me extra information that could be useful in answering questions. Mr Goh has many resources which he uses to teach us content. He also teach us additional to help deepen our understanding of a certain topic. He gives us many questions as practice for exposure and his answers are always geared to what the A levels demand. Moreover, Mr Goh is a very patient teacher who will ensure that we understand the concepts before moving on. I used to forget content after moving on to other topics and Mr Goh would go back to the previous topics and explain them to me again. Not only is Mr Goh a very good geog teacher, he also a caring teacher who ensures that his students have enough rest while studying for As which can be draining at times. Mr Goh always had believed in me and it helped me build my confidence in the examination hall. Mr Goh is a fantastic A level Geography tuition teacher. With him, my Geography grades shot up from U in JC1 Mid-years to A in A levels! The secret to getting A for Geography in A levels lies in two factors: Content and techniques, for which Mr Goh is very knowledgable about. Securing adequate knowledge to show clear understanding of the topic and to demonstrate higher order thinking to the A level examiners is lacking in many A level candidates. Mr Goh,through his many years of teaching experience, knows exactly what kind of content that A level examiners want to see in “A” students scripts.. That is the reason for Mr Goh placing heavy emphasis on these content points during his lessons. With the right content, students will be able to impress the examiners and increase their chances of scoring an A. Sometimes, the student may have adequate content but they do not know how to answer the question in the correct manner. It is always such a pity that these potentially A students fall short of their goals. Therefore, the correct technique to answer the question is essential for getting an A. Mr Goh has up-to-date knowledge on effective techniques that will make you, an aspiring A grader, to be one level higher than your fellow competitors. He not only introduces these techniques to you in-depth, but allows for progressive learning to ensure that you understand the basics of these sophisicated, yet powerful techniques to prove your competency as an A grader for A level Geography. I have gone through Mr Goh’s lessons and I have became an A grader for A level Geography. So can you. Mr Goh is a great teacher. By attending his lessons, you can feel that he has the best interests of his students at heart. This is easily evident through the extended lessons he gives, the compulsory mock tests he holds (that are FOC btw) and the individual talk sessions he has with his group tuition students. Mr Goh ensures that each of his students perform up to expectations and personally marks all our papers such that he knows our weak areas. The amount of dedication he puts in easily differentiates him from other teachers. Additionally, the generous notes and resources given by Mr Goh were extremely helpful in my revision. The extensive range of questions provided exposed me to all the potential questions that might come out for the A levels. The organized and structured notes really helped me save time and understand difficult concepts easily. I admit, I wasn’t the most hardworking student throughout J1 and most of J2. Despite joining Mr Goh’s tuition only in July, he managed to help pull up my H2 Geog to an A by the time A levels came around, achieving the ‘best improved student award’ as well. This is due to his exam-oriented approach and clear teaching style. The accuracy in which Mr Goh predicted the A level questions helped a lot too. Most importantly, Mr Goh gave me the needed push to achieve my A. Thank you Mr Goh for your timely intervention! Mr Goh’s understanding and explanation of various geography concepts has helped me in answering all sorts of questions in exams, as well as understand many difficult diagrams and topics more easily. He is able to spot our weaknesses and give advice on how to overcome them effectively. His experience in geog has also helped me answer directly to questions and identify the key learning points for each topic. Equipped with many resources and notes, they have definitely helped greatly in making my revision for the Alevels much easier. Thank you mr Goh for helping me achieve my A! 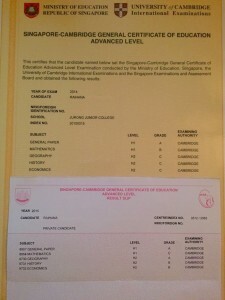 Before attending Mr Goh’s classes, I used to get an E grade for my JC 1 examinations. After joining Mr Goh’s classes, I begin to enjoy Geography lesson even more. Mr Goh is a very resourceful, patient and understanding teacher, who is willing to stay behind after lessons to clarify my doubts.The small class size allows me to have more interaction and exchange of information from students of other colleges. Mr Goh is very flexible with his time and is willing to give extra lessons and even a mock examination to test individual students’ time management. His effective teaching methods such as providing adequate informative notes and past year exam papers with answers, have definitely strengthened my depth and understanding of concepts. Since then, I have managed to improve tremendously in my JC2 geography grade, from a B for my prelim examination and eventually achieving an A for the A level examination. He is a wonderful Geography tutor that I will recommend to anyone who is willing to work hard with him. Thank you Mr Goh! Mr Goh was someone who was very patient and I really benefited from his style of teaching. What he would do is he would go through different types of questions and not only teach us to answer them using our content knowledge but also how to break questions up according to marks given which is an extremely useful skill. This skill also made long essays seem less dreadful and gave me the confidence to embark on them. Mr Goh had great foresight and covered the more important topics in greater detail and he also took the time off to give us a full 3 hour written test for 2 seatings which really made me admire his dedication. To be honest, Mr Goh also gives out a lot of useful content that makes it easier for students to grasp the format of papers which allows them to ace their exams. Mr Goh also charges quite a minimal sum (compared to private tutors) outside and keeps his class sizes small so as to optimise the learning experience. Lastly, I wouldn’t have gotten my A for Geog if not for Mr Goh so thank you Mr Goh! Mr Eric Goh is a teacher whom you can trust your Geography grades with. His teaching methods are precise and straight to the point that meets the requirements of securing an A grade. His rich experience in years of teaching Geography has improved my H2 Geography grades dramatically from an U to an A in 2 months, despite having shaky concepts as i was occupied for the past few months upcoming to As. The adequate amount of test Mr Goh gives to identify my strength and mistakes were definitely crucial to securing my A at the A level in a short time.Coupled with his experience,he is able to rectify my mistakes fast and work on my strengths. Honestly, Mr Goh is the right choice for a Geography tutor if you’re willing to put in the effort to work with him! 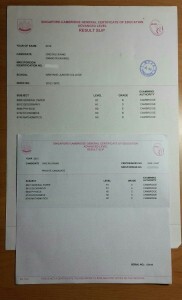 After attending Mr Goh’s lessons for 2 years, I was able to slowly improve my grades. Being a repeat student with no prior background of Geography save for combined Geography, the prospect of achieving good grades for Geography seemed rather slim. However, after the 2 years of lessons, I managed to improve my grades from a barely passing grade in promos and the prelims, to an A in the A Levels. Mr Goh’s lessons are well structured, in the sense that he aims to cover every aspect of the syllabus within the tight time frame of four lessons per month. He does so by first going through the key points of the syllabus in the first few months, and subsequently going through other schools papers and past year papers with the class. Despite a small class size, Mr Goh has students from various schools in each class, which teaches at different paces, as well as starting from different topics. Mr Goh handles this by adjusting timeslots to a select group of students who require tutorage on certain topics. As a result, all his students would have covered the entire syllabus with him before he starts to go through the exam papers. Lessons are targeted around the vital key points of each topic, making sure each student is able to achieve an all rounded overview of each topic, so as to understand what each topic really means, before going into the details. He does so by being animated in lessons, using various objects (even giant plant leaves) to illustrate what he means, via actions and demonstrations. Overall, lessons are enjoyable and informative, and the small class size makes it a conducive place for learning. Mr Goh’s timeslots are flexible, and he is willing to give his students extra lessons if necessary, especially before the examinations. He does not hesitate to answer question even after the lesson has ended, as a consultation group. All the above makes lessons a fruitful experience for his students, who enter the exam hall feeling prepared and ready for the hurdle that faces them ahead. I am pleased and honoured to be under the tutorship of Mr Eric Goh for the past 2 years. His impressive level of dedication to his students impressed me and he never failed to make time to answer questions however last minute they were. Mr Goh is also a resourceful teacher who provided me with a myriad of notes and learning materials that certainly added depth to my learning of the subject. Mr Goh was also able to teach me how to be exam smart especially in areas of time management and studying techniques. This helped me a great deal given the tight schedule that all A level students have. Mr Goh has played a key part in my academic journey. Without him, my passion for the subject would not have deepened. I feel honoured to be able to call him a friend and a teacher. Mr Goh is a teacher who simply knows geography like he breathes the air surrounding us. He teaches me not just the knowledge of geography, but more importantly, the skills and key concepts that we need not only to know, but to score in the A level examinations. Key tips and specific information are constantly being re-emphasized to us during his lessons to ensure we are able to reiterate them confidently and quickly at the tip of our fingers before the exams. The need to ace geography for every student taking it is his top priority and he seeks to educate you in the method of not just memorizing geography facts as a whole, but to understand the different concepts especially in the complicated topics like plate tectonics or the wind movements and its effects in atmospheric processes, allowing one to have the ability to apply the concepts to the various questions that comes out in the exams. Although he is a rather quiet teacher outside of class, he is actually rather funny and amiable during the lesson ad makes geography and enjoyable and fun experience for me in particular. Mr Goh, Wanted to thank you for all the effort you have put into teaching Benjamin. You have never criticised his shortcomings and wholeheartedly devoted all the tuition time to teaching him. It was one of his weakest subject but became his strongest under your tutelage. Geography was the only A1 he had. The rest A2. To be honest, he could not have done it without you. Thanks you millions! A resounding ‘Yes’ for Mr Goh and have a blessed, joyful and fruitful year ahead with good health! After being under the wings of Mr Eric Goh for almost a year, 2012, I dare say that without his help, I would have gotten much worse for my O levels results. Here are the many great things that he had done within his ability to ensure that we get our As for Geography and most challenging subject, Social Studies. Before I was introduced to Mr Eric Goh, the sight of B3 and B4 on my report card for my humanities was a common sight. My elective geography was a borderline A1, but my Social Studies was on the border of failing. Thus, my Social Studies pulled down my elective humanities, regardless of how much effort I placed into Social Studies. In 2012, I finally met Mr Eric Goh who had changed my perspective of Social Studies. The subject that I dreaded the most, the subject that I despised the most, had become the subject that I enjoyed the most. His guidance was an eye opener for me and allowed me to thoroughly grasp the concept of Source Based Question (SBQs) as well as Structured Essay Question (SEQ). Combined with techniques to tackle SBQs and SEQs, I finally managed to score A1s for my elective humanities. My geography was scoring a consistent 76-85 while my Social Studies was scoring between 70-79, with it subsequently scoring A1s after the second term. His lessons are interactive and he frequently drilled us on how to tackle all the questions for Geography and Social Studies. For geography, he handed out practices for us to hone and perfect our skills in answering such questions. He also gave us sneak previews on unorthodox questions and tactics to answer them should they ever appear in our examinations. Once we had covered and learnt all of the textbook related examples, Mr Eric Goh will go the extra mile to share with us relevant examples for geography that are not found in the textbooks so as to spice up our essays and make it outstanding. For Social Studies, my problem was my weak interpretations of the SBQs as well as the failure to comprehend the questions given in SEQs. Countless hours were spent under Mr Eric Goh’s caring watch to help me, which finally led to me being able to handle Social Studies. Similar to Geography, once we were able to expertly handle Social Studies, he shared with us numerous questions that were notorious for catching students off-guard in the examinations. Therefore, we were confident when Os neared. Practices aside, Mr Eric Goh also covered and explained contents in the textbook so that we can better understand them. During lessons, he always advised us to take note of some key-pointers that could be essential in answering questions. Mr Eric Goh is a caring teacher that selflessly offers his time to groom any students that falters during his class, ensuring that they would not falter again. He also engages his students to think during his lessons, encouraging them to think out of the box when tackling questions, thus we are able to accurately answer questions in Social Studies and Geography. Thanks to Mr Eric Goh, my L1R5 for 2012 Ordinary Level Examinations is a 8 (it was due to unforeseen circumstances that my English fared badly) with my elective humanities scoring an A1. If it weren’t for his aid, I would have scored a much worse L1R5 and gone to a worse Junior College. I’m thankful for his help and guidance that helped me pave the way into entering a better Junior College.